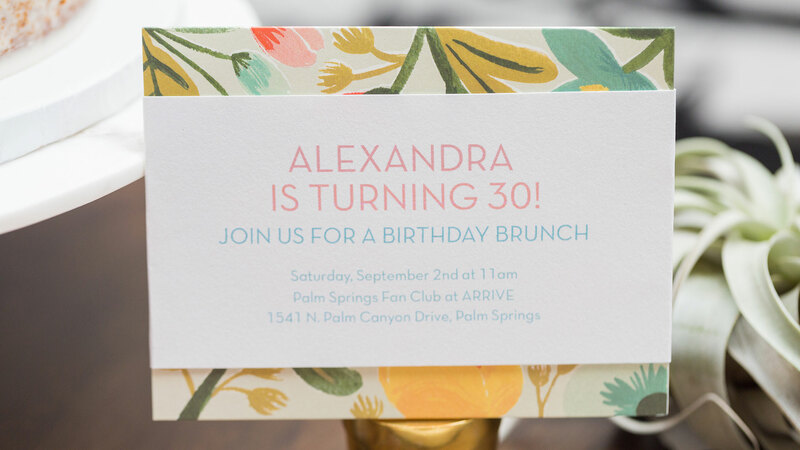 Greater Palm Springs is the perfect spot for a birthday celebration! Whether you&apos;re coming in from elsewhere in SoCal or planning from across the country (or the world! ), there&apos;s a little something for everyone and every kind of event, with so many unique hotels, restaurants and vacation rental homes, plus of course the abundant sunshine, pools, palm trees and mountain views! 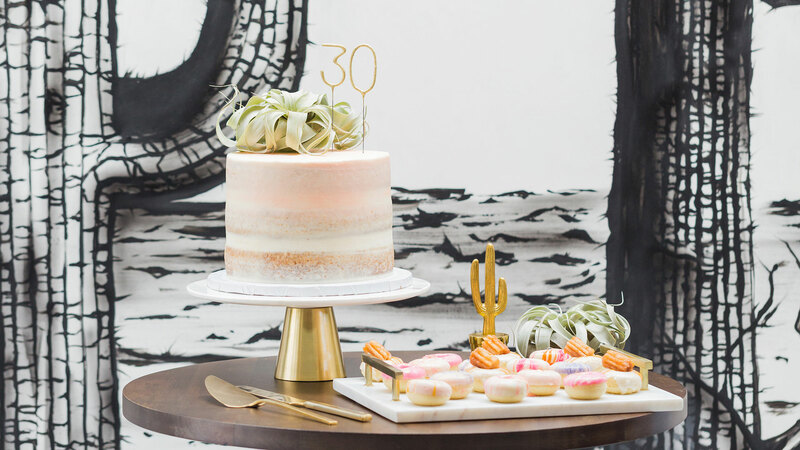 We recently created a birthday party inspiration shoot to showcase some ideas and resources for a party in the desert. 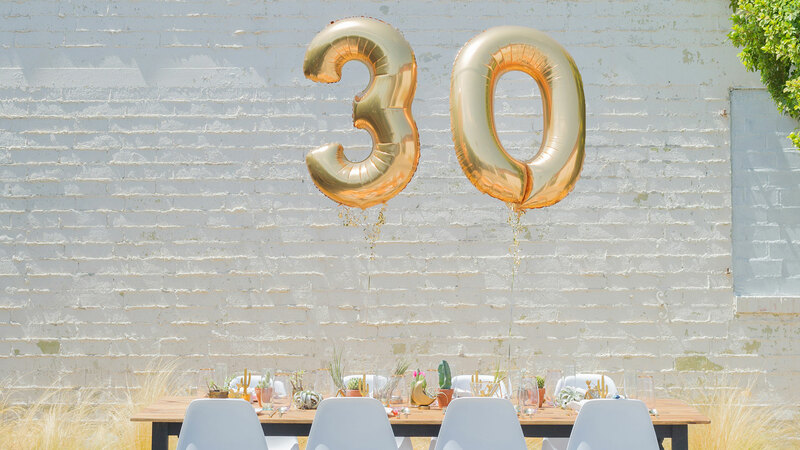 It&apos;s a 30th birthday brunch party that we staged at the new event space at ARRIVE, called the Palm Springs Fan Club. It features both indoor and outdoor space, which we love. Erica Mendenhall photographed everything for us; she&apos;s based in the desert and can help document any kind of soirée! Our 3-0 balloons are from Balloony Tunes, which is a little store in Cathedral City that has been around for over 30 years! It also happens to be located next door to Boomers, a mini golf and go kart place that is a fun spot for a kiddo&apos;s birthday (or really any age!). 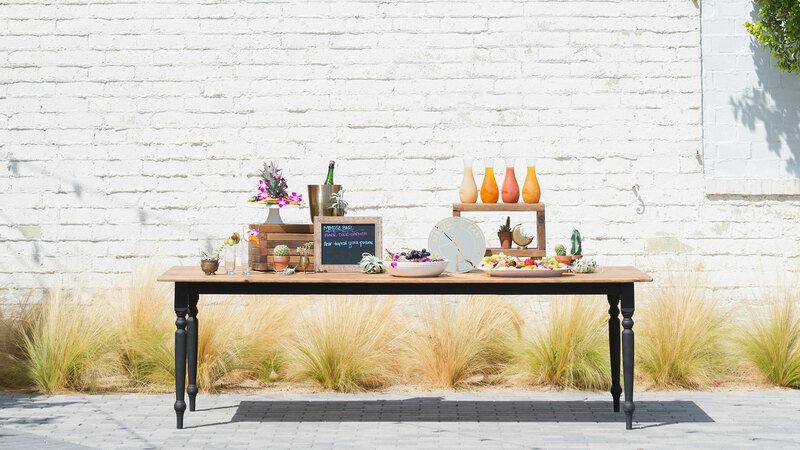 We brought together some awesome local resources to create our birthday brunch setup! 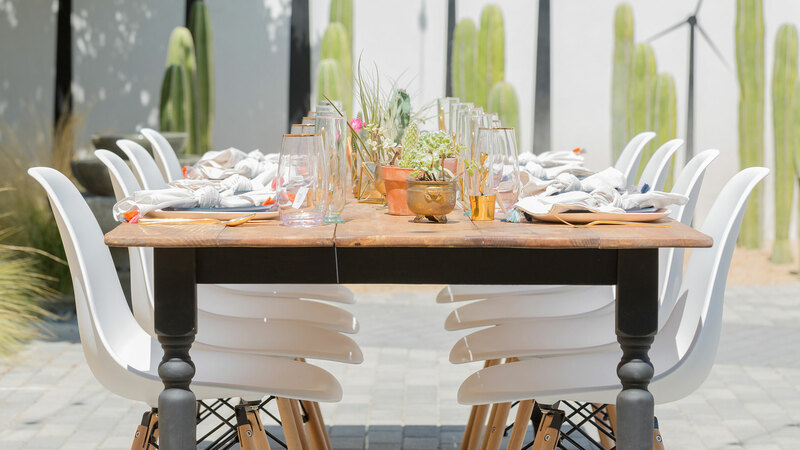 The table and chairs are from Planks and Patina, which is a boutique event rental company based in Palm Springs. They have a great assortment of furniture and décor rentals, including midcentury modern and bohemian pieces that are perfect for an eclectic vintage vibe. 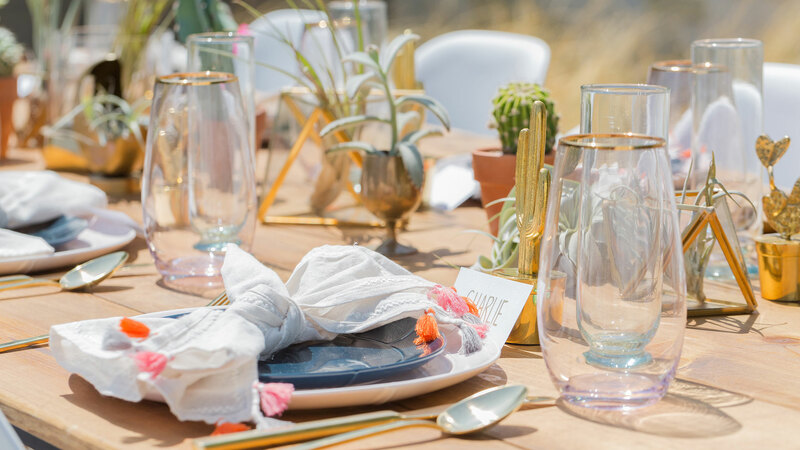 Our tabletop design incorporates some favorite finds from our friends at West Elm Palm Springs, including mix & match dishes from the new Seam dinnerware collection, gold flatware, tasseled napkins and pink-tinted glasses. The champagne flutes, made from recycled vintage glass, are from a new downtown Palm Springs shop we love called Thick As Thieves. 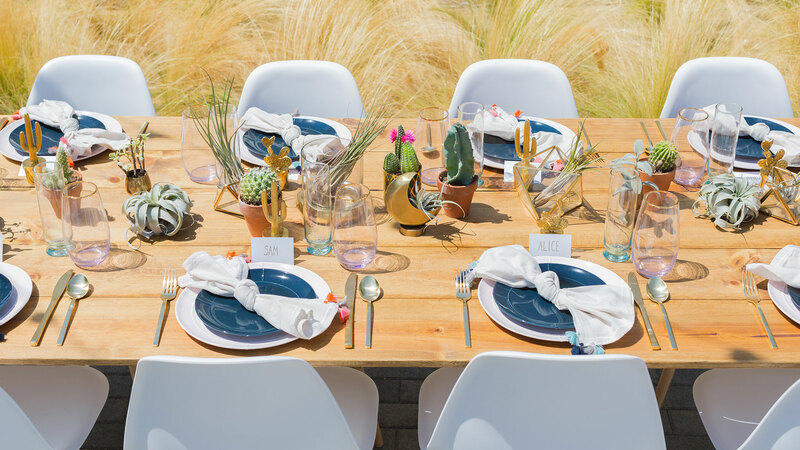 Down the center of the table, we used an assortment of small containers with air plants and potted cacti and succulents, with the idea that these items can be taken as favors by the party guests to use in their homes. 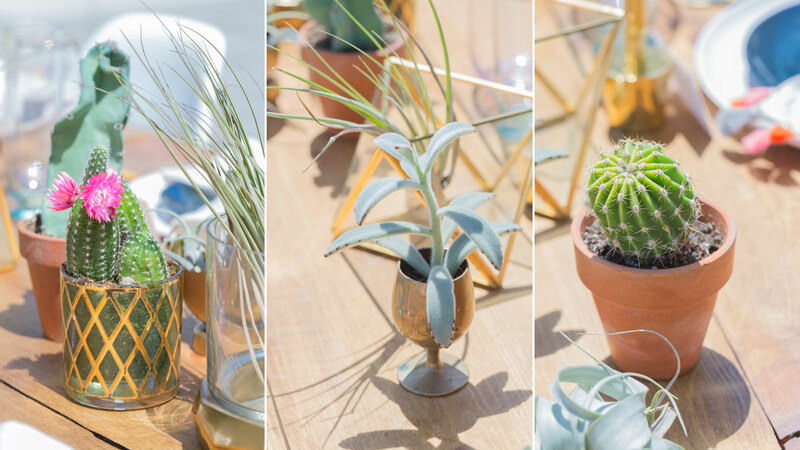 Thick As Thieves sells tiny potted cacti and succulents in terracotta pots, as well as in small vintage brass cups and pots, plus air plants that can be tucked into any container or just set directly on the table. 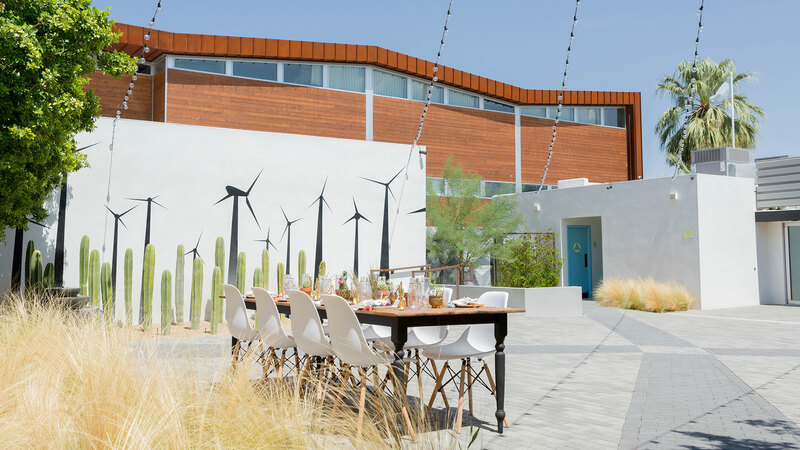 At West Elm Palm Springs, they have a do-it-yourself station for planting cacti and succulents in terrariums and other containers, as well as a variety of air plants. Above left: A cactus planted in a vintage glass found at Angel View Thrift Store, in front of a cactus in a terracotta pot from Thick As Thieves. Middle: A succulent in a vintage brass cup from Thick As Thieves, in front of a brass and glass geometric terrarium from West Elm Palm Springs with an air plant inside. Right: Air plant from West Elm Palm Springs in front of a cactus in a terracotta pot from Thick As Thieves. 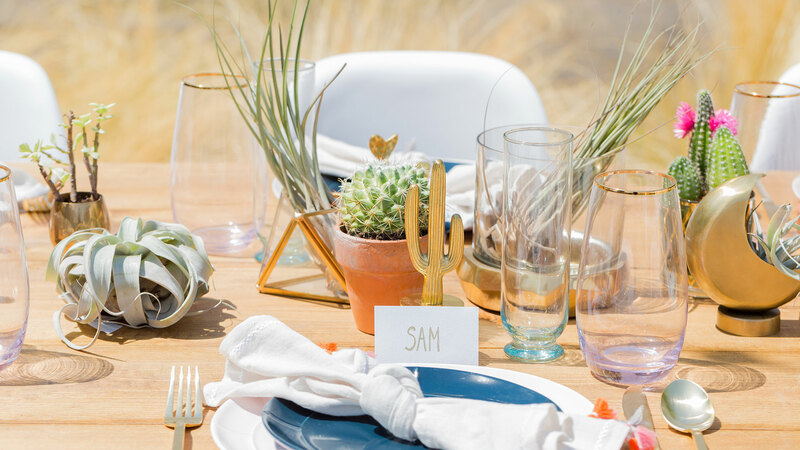 The place cards are propped against miniature brass cacti that are available in two styles at West Elm Palm Springs. Aren&apos;t they the cutest thing?! The place cards are just simple white card stock and gold paint pen from Hobby Lobby in Rancho Mirage. 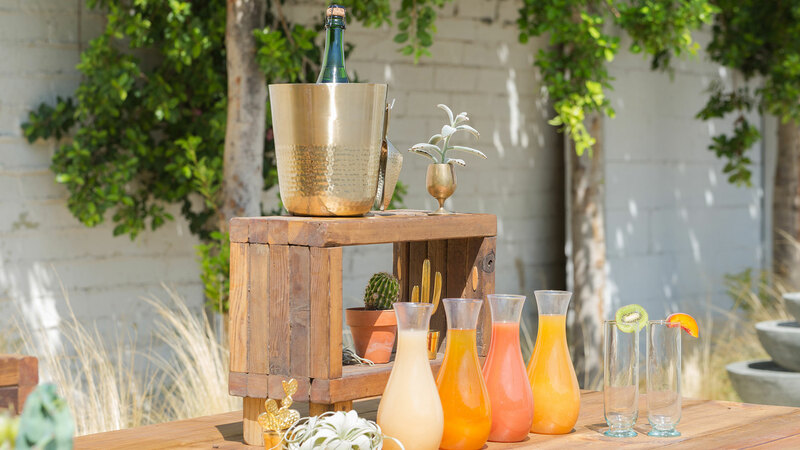 A brunch birthday party clearly calls for mimosas, but we took it a step further with a DIY mimosa bar! The ARRIVE team assembled a great assortment of fresh juices and fruit to jazz up your Champagne. And of course don&apos;t forget the cake! Over the Rainbow Desserts in Palm Springs created a delicious multilayered cake that we placed on a marble and brass cake stand from West Elm Palm Springs. This style of cake where the layers show through faintly is called a “semi-naked” cake. The 3-0 cake topper is made from mini sparklers that are available at Nothing Bundt Cakes in Palm Desert. 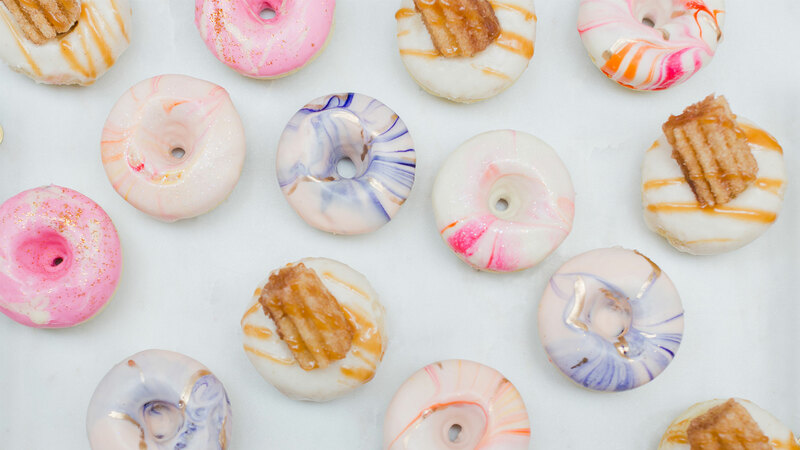 In keeping with the brunch theme, Over the Rainbow also made the most darling assortment of mini donuts, including churro-topped and marbleized with a little sparkle, which are sitting on a marble and brass tray from West Elm Palm Springs. Below is a wider look at the Palm Springs Fan Club event space, located just next to the hotel. In additional to birthdays, it’s a great spot for weddings, bridal showers, bachelorette events and other celebrations. 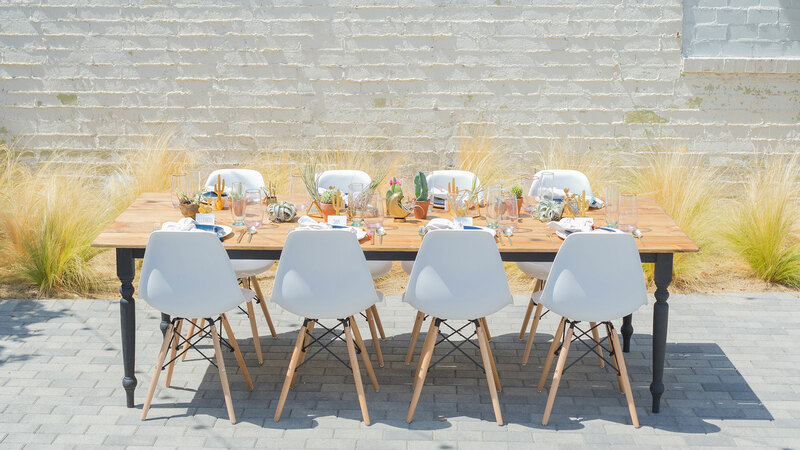 Thank you to everyone who helped bring our birthday brunch party concept to life! Photography by Erica Mendenhall for Palm Springs Style.